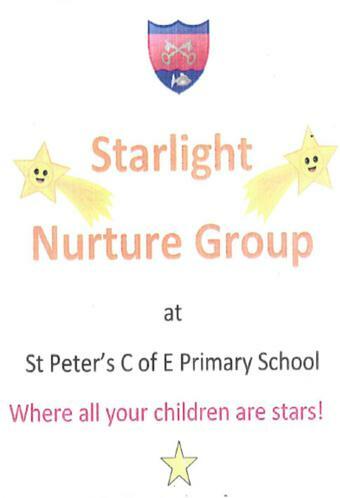 Welcome to St. Peter's CE Primary School's Starlight Nurture Group. Mrs. Crow & Mrs. Hayden will work with any child who attends the Nurture Group for three afternoons every week. The children within The Starlight Nurture Group work in a small group of 8 children for up to 3 terms. The children spend the rest of the time with their mainstream class. Nurture Groups were originally set up in the 1970's to help children access education. The aim of a Nurture Group is to help children participate fully in all school activities by providing an environment where a child feels safe and secure, being able to explore and develop without feeling threatened or having a sense of failure. Nurture Group staff work closely with parents/carers and class teachers to help children grow emotionally and socially at home and at school. The Nurture Room, in which the Starlight Group will work, combines elements of both home and classroom.